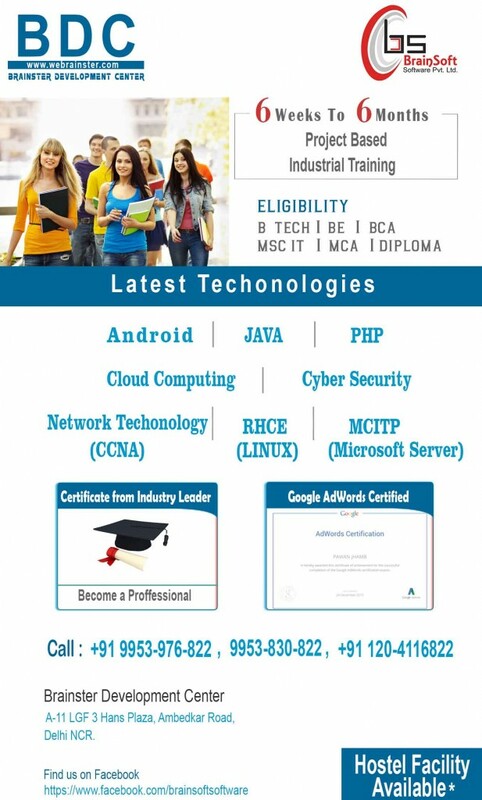 Industrial Training | BrainSoft Software (P) Ltd. Opportunity to appear in the Placement Drives of reputed MNCs. BDC being a decade old renowned Organization, our Training Certificates are recognized emphatically and accepted worldwide. Separate Certificate for project work on company letter head, after completion of the project. Certificate of Honor & a trophy exclusively to the Best Trainee in each Batch. A Discount of Rs. 1,000/- to BDC Ex-students (only one type). Learning materials will be provided to all the enrolled students. Once after becoming a part of BDC Family, student will be provided 1 Year Membership Card worth equivalent to $14 free of cost, through which the candidate can revise the same course of similar fee and number of other benefits. Flexibility provided for opting batch date. Batch Dates once selected may be changed prior to 7 days of starting of the batch. After successful completion of the training, interested trainees will be provided Live Projects undergoing at our development Cell (Brainsoft Software Private Limited). Assured gifts to first 200 registrations for our 6 Months MCA Industrial Training Program. Brainsoft Software Private Limited is registered as a Pvt. Ltd. Company under the Companies Act 1956 and approved body by Ministry of Corporate Affairs (MCA), Govt. of India. Training provided by BDC will be considered as the compulsory Summer/Vocational/Industrial training as per the universities course curriculum. Free of cost Web Space and Sub-domain will be provided to interested candidates to make the projects live on web. Free of cost Aptitude & PD training will be provided to all the 6 months candidates.